Change. Every other election in any country you choose has change as its theme for at least one of the parties involved. Change is welcome. Change is good. Change will get our asses into power, at which point the last thing we will want is change. That's when continuity will be king. Stability will make us all feel better. At circa 9.0pm on Saturday, November 17 last there wasn't a man, woman or child with any class of interest in Irish rugby who didn't want more of the same. Ireland had just beaten New Zealand for the first time in this jurisdiction, and a reward of second place in the world rankings seemed wholly appropriate. The only change on the agenda would be the 14 alterations to the starting XV to play USA in the final game of the November series. That side would heap 57 points on the Eagles. So all the bases were covered. In normal circumstances then to have 13 of the starting side who beat New Zealand available to toe the line against Wales in the last game of the Six Nations was - praise the lord - more of the stability we had come to crave. Except that by then the appetite for change had been stoked by the fact that Ireland were going to the final fence in the Championship believing second place in the table was the best finish on offer. And this in the space of four months, a period in which - uniquely - all four provinces had qualified for the quarter-finals of Europe's Champions or Challenge Cups. The bipolarity that defines our sporting psyche shifted the population south. Some of the flight attendants on that journey were the same crew who had been in a state of ecstasy at the end of November. So they went from laying wreaths at the feet of Joe Schmidt to flaying the arse off him with the same shrubs. His legacy, which had been declared untouchable, had been shredded. There are two issues that present themselves now: does the coach change a bunch of the runners and riders who have covered the ground so well to this point? And does he change the way the team tries to play? If we can start with the second bit, then yes. It doesn't have to be a radical overhaul - say, going from the Heyneke Meyer approach at Stade Francais of not kicking the ball within sight of your own posts to the high-risk game of Johan Ackermann at Gloucester - but we have long contended that Ireland work too hard for what they get. They have the technical ability, and certainly Joe Schmidt has the smarts, to get as good a return from fewer collisions. True, it doesn't help that unlike France and England our athletic range is limited by having mostly a monocultural gene pool, but neither does it mean we can't play a bit. As for the personnel, there are shades of 2007 when Eddie O'Sullivan would change the side only if he was given video footage of his go-to men, with their bags packed, breaking camp under the cover of darkness. And then only if the logistics of recapturing them were impossible. Schmidt clearly has done more to spread the playing load but his spine of Rory Best (aged 36/117 caps), CJ Stander (29 next week/31), Conor Murray (29/72), Johnny Sexton (33/83) and Rob Kearney (33 next week/90) is not up for debate. It should be. Best has done a fine job but is no longer doing a very good one. Schmidt would sooner change his gender than his current captain, convinced he is the best man for the job to the end of Ireland's World Cup campaign. Neither will he mess with his halfbacks. We don't doubt that Murray and Sexton are the best men for the job, but had Joey Carbery been fit he would have seen plenty of action over the last few weeks, and it was a mistake to leave Murray struggling on the field when Kieran Marmion was fit again and on hand. It would have been interesting too had Will Addison been fit. There is a gap between what Jordan Larmour will be able to bring and what he brings now, and it will be Andy Farrell's watch before that closes. So Kearney is immovable, even though his best days are behind him. If Andrew Conway played more rugby for Munster at fullback it would help. Equally, it would have been better for all concerned if the analysis of what happened in Cardiff had stuck closer to the facts rather than the humiliation of being beaten out the gate. The problem is in giving the punters what they want rather than what they need. That would require some explaining though, and in circumstances like these if you're explaining, you're losing. So blaming the ref is not a great strategy. This seemed to dawn on Joe Schmidt in the gap between the pitch-side tv interview immediately post-match and the press conference that followed about 40 minutes later. Perhaps he was remembering the complaints about Wayne Barnes, who reffed Ireland's previous two defeats there on Schmidt's watch. So the narrative changed a bit in that 40-minute gap last weekend, and then he couldn't help himself. The reality is that Angus Gardner put a saddle on Ireland and rode them off the park. It had a material effect on the game and arguing otherwise is either to misunderstand rugby's laws or to be so wedded to the doomsday scenario that the facts become inconvenient, collateral damage. The scary part is that a team stuffed with high achievers were so low on confidence they couldn't fire a shot in response to the referee. Loosening up the game plan and changing a few of the actors will improve the script if the players actually believe that Schmidt believes it. Yes he is a control freak but in this Championship genuinely he extended the players' licence to take the scenic route, but for whatever reason they largely stuck to the high road. 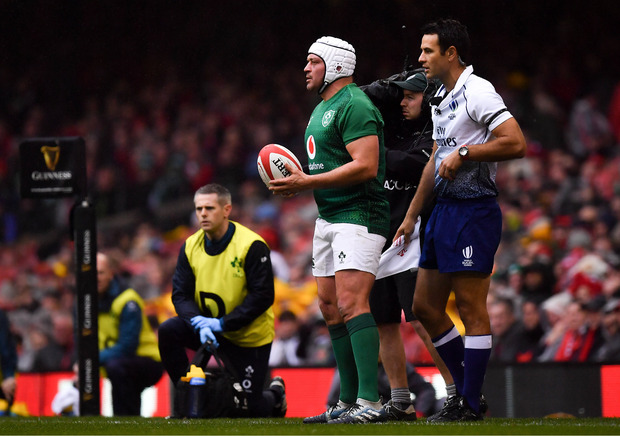 If those co-ordinates aren't straightened out then we will have a World Cup of woe, and then, under successor Andy Farrell, a degree of change that can be filed only under the heading clean-out.